Very few people from the West Coast know the wines from Texas and even less have tried them. I first found out about this one-of-a-kind wine region when I was traveling cross-country from New York City to Los Angeles via I5. 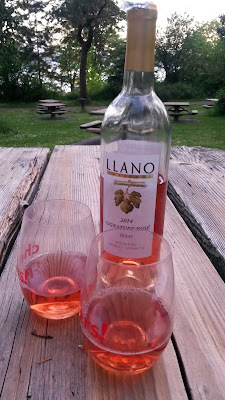 A stop at the Hill Country Wineries was a pleasant surprise- I liked most of the wines and the warmth of the people. I recently received the 2014 Signature Rosé from Llano Estacado, located in the Panhandle region. I consumed it in a record high temperature day -87 F on May 2nd in Seattle - in Lincoln Park. It was the perfect day for the delicate, aromatic and refreshing rosé, a blend of Mourvedre, Cinsault and Grenache. As it was a last minute decision, it was only paired with lentil and veggie chips and raw pizza crackers that turned to be a delicious pairing. But if you have more time, prepare a salad or fish tacos!